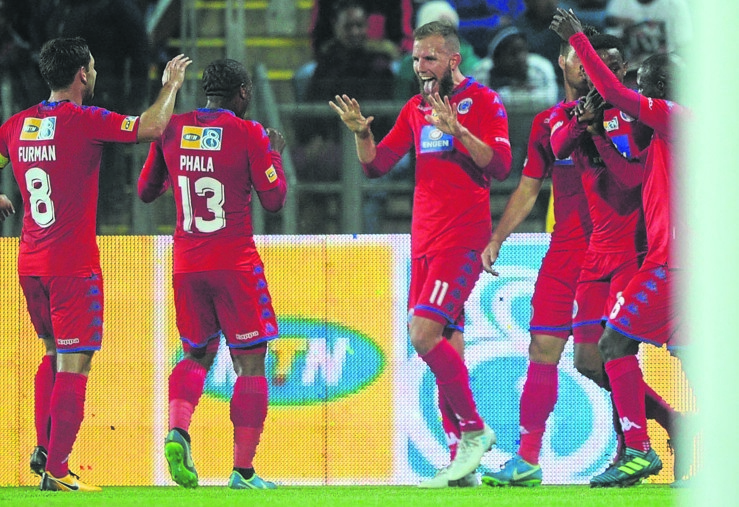 SUPERSPORT United are out to end their 13-year top eight hoodoo after beating Maritzburg United 2-0 at the Harry Gwala Stadium on Saturday to reach the final of the MTN8. The Tshwane outfit won their two-legged semifinal against the Team of Choice 3-1 on aggregate. Matsatsantsa a Pitori last won the top eight cup back in 2004, beating Kaizer Chiefs 1-0 when it was still known as the SAA Supa 8. They last played in the final in 2012, when they lost 2-1 to Moroka Swallows. SuperSport head coach Eric Tinkler and his charges are one match away from possibly ending the 13-year top eight drought. He said they beat a motivated Team of Choice thanks to his players, who have proven to be cup specialists of late. The Tshwane outfit will be playing in their third consecutive cup final. They won the Nedbank Cup in June, lost to Cape Town City last season in the Telkom Knockout and now are in the MTN8 final. If they win Wafa Wafa it would only be the second time in the club’s history that SuperSport have won a top eight competition. Said Tinkler: “Experience in cup competitions really helped us against Maritzburg. We needed to match them in effort. They came highly motivated, you could see it in the way they played. Tinkler applauded Jeremy Brockie’s professionalism and commitment to the team after his failed move to the club’s bitter rivals Mamelodi Sundowns last month. The New Zealand striker scored both goals against Maritzburg. The former Orlando Pirates and Cape Town City coach also said they would not have time to celebrate their victory over Team of Choice. He said today their focus would shift to their upcoming Absa Premiership clash with Platinum Stars. The match will be played at Lucas Moripe Stadium tomorrow (7.30pm).